Google gets searched more than 1 billion times every day–creating an unbelievable opportunity to get your business in front of thousands every minute…If you know what you’re doing, and if you don’t then get someone who does know to do it for you.. If you’re just starting off as a photographer, or just looking to get more traffic onto your photography website. than we are using our experience to help you. Five years into using Adwords to promote our website we are hoping to help others. Google Adwords is a minefield if you don’t know what your doing. We all want to attract new custom using the internet, and as well as SEO, PPC is a perfectly good lead generator. Showing your ads to those people looking for providers of those services is perfect targeting, but getting it wrong can eat up your money faster than you would believe. We can provide you with a Adwords Management service that will bring quality traffic to your website..fast!! Drop us an email at info@miketurnerphotos.co.uk, alternatively if you fancy trying it yourself I have some valuable tips and information below to help you. In a recent study on the effectiveness of social media as a sales generator compared to PPC and SEO it concluded, “As far as driving online sales goes, social media is an astoundingly ineffective channel. If you want to grow your online sales, the evidence is clear: SEO and PPC are where you need to invest” from www.barryadams.co.uk. Adwords is a great market research tool. It allows you to test ideas in a live market. It’s ok asking people if they would buy your product during a field test, but the real acid test is when they see your offer and actually purchase it. Think of an offer you wish to promote, set up a landing page specifically for that promotion, which is not accessible via your website navigation (can only be found via your PPC ad link). Set up your Google Analytics for that page so you can track the traffic that arrives there, and have a call to action (buy it now button or email capture form). Set up your Adwords ads to accurately reflect the offer, as you don’t want people clicking on your PPC ad (which costs you money) only to arrive on your landing page which is offering something entirely different (all they will do is leave, and you will learn nothing). Set the ad to run live and within 10 minutes your ad will be running. If you find a lot of people clicking on your Adwords ad and then following your call to action, you know the offer is popular. if not then you can go back to the drawing board. Obviously my description is only outlining the main process you need to follow, there is a little more you can do to split test different PPC ads, and landing pages and layouts. To both improve CTR and conversions, but hopefully you get an idea about how Adwords can help your market research. The most important aspect to getting your Adwords campaign off to a good start is knowing what people search for when they are looking for your services. Understanding their motives and where they are in the buying cycle can help prevent you wasting money on searchers that are just looking for information with no intention of buying your services. For example you might presume “Portrait Photography” to be a good search term, surely people using that particular search term are looking to have portraits done, right?, wrong. A keen amateur photographer could be looking for ideas, or someone in the initial phase of the buying cycle could be doing some research, with no intention to purchase at this time. notice how these are mainly review sites, Google is doing a good job at identifying the fact that I have a general search query and thinks that I would be best served with these results. Good job Google. Notice below the PPC ads that show up right at the top of the page. You can see a couple of manufacturers are there and Argos, who are using their well known brand name and huge marketing budget to get in front of prospects early in the buying cycle. While this is a legitimate marketing tactic, you will need to have deep pockets for it to be worth your while. As you can see from the organic results on the left and PPC on the right more of the big retailers are showing up now in the form of Amazon and Curry’s, strangely enough Argos are not showing for this search, but maybe that is down to the fact that they are not stocking this particular make of TV. From a marketing point of view the second search shows I have a clearer definition of what I want, I have obviously done my initial research. I have indicated that I am closer to the buying phase of the buying cycle, than I was on my first search, where I have searched much more broadly. 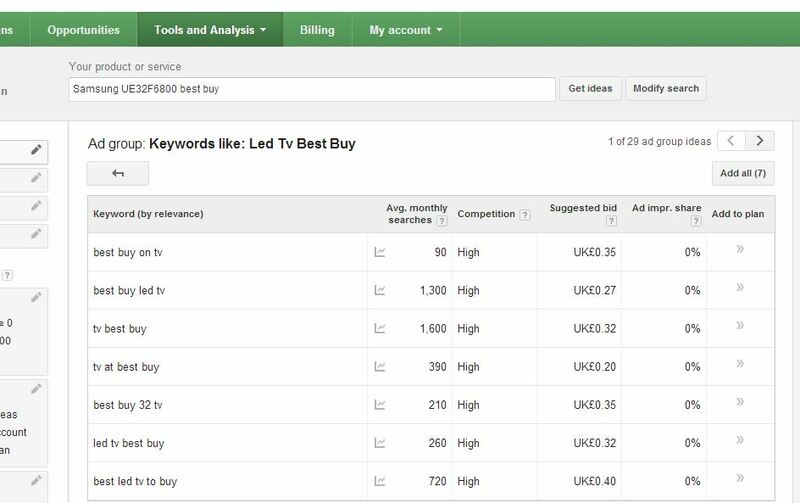 Looking at my keyword planning tool results (available in Adwords control panel) you can see that clicks for the most popular search term variations can cost between 67p and £1.41 per click if I was to do a PPC Adwords campaign around these keywords. There is however a lot of search traffic for them from 1000 to 33,100 per month. notice how the make of TV is not showing, you can see the buy now is showing along with LED in the results, the Cost per click is lower than the first search because search volumes are lower, CPC ranges from 20-40p and volume 90-1600 searches per month. If you are on a limited budget it would be more cost effective to target the second search terms, which as well as indicating more buying intent, offer cheaper CPC. You do however need to make sure that the search volumes are adequate enough to make it worth your efforts.